SINGAPORE - The boos rang out from sections of the 4,500-capacity crowd at the Padang on Sunday evening (Nov 5), as Romaric Camou lined up to restart play in the Ablitt Cup final between the France Development Team and Daveta. 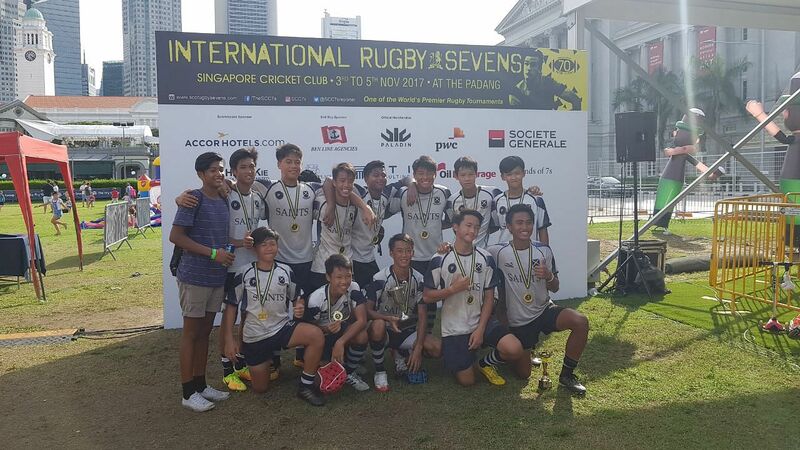 The final had ended 21-21 in regulation time, and the team to score first in five minutes of extra time would lift the Cup in the 70th edition of the Singapore Cricket Club (SCC) International Rugby Sevens. Within the first minute of time added on, the referee awarded France a penalty 25 metres out. Camou, 21, coolly stepped up and converted the penalty, as his team-mates rushed to celebrate with him. “I heard the boos, but for me, there was no stress (in taking the kick),” Camou told The Straits Times after the match, as his jubilant team-mates celebrated around him. Gavidi, 25, said: “We went into this match high on confidence but after our first try, we gave them some easy balls. But it was not enough, as Camou's extra-time penalty ensured France's first Ablitt Cup. Earlier on Sunday, St Andrew’s Secondary School beat Anglo-Chinese School (Independent) 36-5 in the Under-14 final to win the Len Foster Cup, while Tanglin Trust School beat the United World College (D) in both the U-16 and U-19 finals, by 19-7 and 22-21 respectively. Of their win, Saints captain Lucius Yau, 14, said: “We were surprised at the result. We thought it would be a close match. “We messed up our tackles and communication in the first half... second half, we just went all out; I told the boys that they could do it. "The win today is definitely a boost in confidence for us, since we will be playing in the Saints 7s next week," the teenager added, referring to the invitational tournament the school organises yearly. SASS went into half-time with a 10-5 lead, with Gabriel Chew scoring both of the Saints' tries. Asher Rainar each scoring a try, while the team shut their opponents out at the opposing end. ACS (I) fly-half Alex Hunter said his team paid the price for not coming out strong in the match. The 14-year-old said: "The Saints have obviously improved a lot since April, and we didn't come out as strongly as we wanted to today. "The second half came down to our fitness levels - it was a hot day and we worked really hard in the first half, but we just ran out of gas."